Kimberly Martin, a high school agriculture teacher, created her business, Poo-fessional Recycled Organics and Land Management, due to a complaint from a neighbor regarding her and her husband accumulating yard waste from trimming trees. They were told they needed a permit. Martin reached out to the Florida SBDC at Hillsborough County to help her with overall business management. Having owned a business before, [her consultant] Corey McCaster was able to help Martin utilize resources that were available to her that she wasn’t using before. On top of assisting with the company’s management, McCaster even had some ideas of his own for the business. Poo-fessional Recycled Organics and Land Management is now one of six worm farms in the state of Florida. Martin’s biggest success so far is overcoming the day-to-day obstacles in this busy industry. Currently Martin is working on getting a 7a SBA loan, which will help the company purchase new equipment to further serve clients with even more dependable product deliveries. The company has already been able to use more than $100,000 in capital access throughout its course of business. Currently, the company has made contact with Scott’s Miracle-Gro to be a potential vendor for them. Further down the road, the company would like to be on the shelves of Home Depot and Lowe’s. 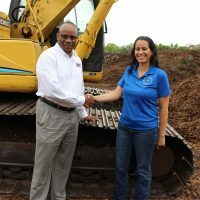 Poo-fessional Recycled Organics and Land Management is continuing to grow in their industry and will continue working with the Florida SBDC at Hillsborough County to further that growth. “They have incredible resources, they have really good people, and there’s a lot of things that most companies don’t even know exist,” Martin said. “I contacted the SBDC about three years ago but never followed through. I ended up circling back around and getting connected with the SBDC, and boy has it made a difference. "If it were not for the SBA, the SBDC, and my SBDC consultant, our company wouldn’t still be here."